Houses with a classical style always have an advantage in that they fit perfectly into their surrounds. They harmonize with nature or work well with other houses in the neighborhood. They also always look elegant and contemporary. If a classic house is equipped with a contemporary design, with a generous layout and plenty of light, it can adapt flawlessly to the needs of the residents. 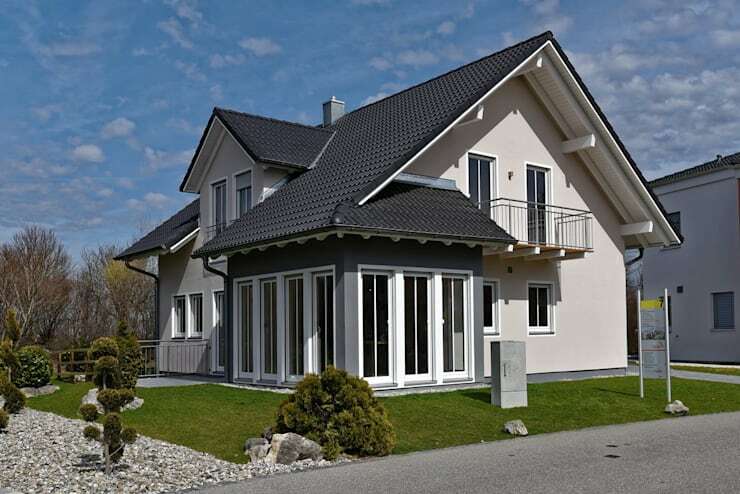 It can also offer a dream house design! Let's explore this one and see how lighting professionals LICHT-DESIGN SKAPETZE GMBH & CO. KG have managed to accentuate every element of this classic design. The facade of this house has a traditional, tasteful style. The beige walls dominate, while the high-roof is finished in an elegant gray. The dark roof harmonizes with the beige walls and white finishes, creating a very elegant look and feel. Do you see how the gorgeous garden accentuates the exterior design? 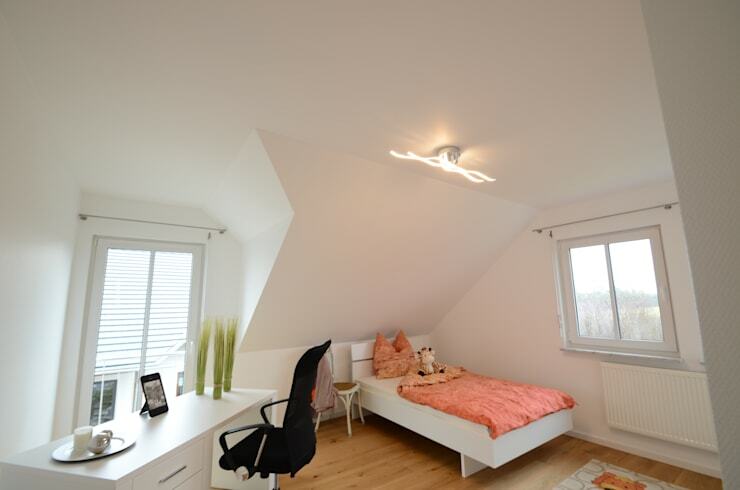 The bedroom is situated in the attic and makes the absolute most of space! 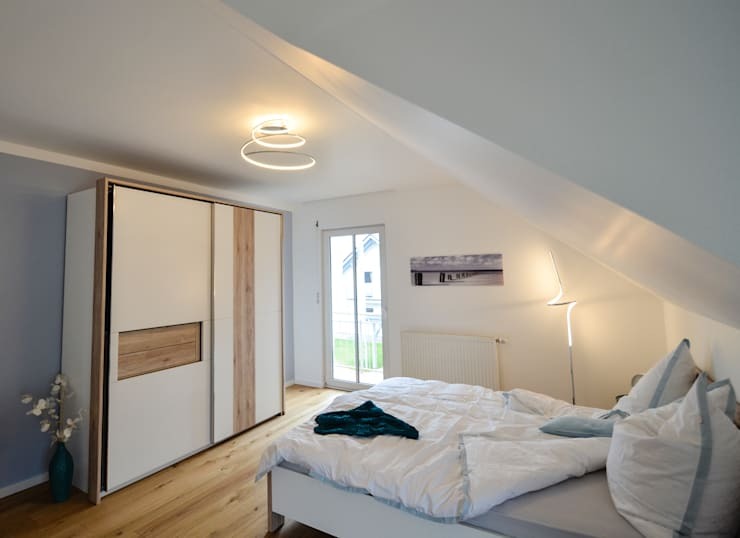 The bed has been positioned under the slant while the main wall is equipped with a high wardrobe. The wardrobe features clear white and warm wooden elements, enhancing the charm and coziness of this space. The white walls and the funky light in the ceiling make this room look very big too! Do you see how lighting is used to illuminate detail and design? The designers have also opted for a high window, which allows natural light to flow into the space. The dining room is beautifully positioned in the corner of the house, featuring elegant gray tones, similar to what we witnessed outside the home. The wooden table features six dark gray, stylish chairs, which contrast with the white of the walls. The hanging lamp with three designer lights makes any further decoration superfluous! Do you see how functionality and style work hand in hand? In the kitchen, the wall colours deviate from the rest of the tones and colour palettes that we've seen throughout the home. 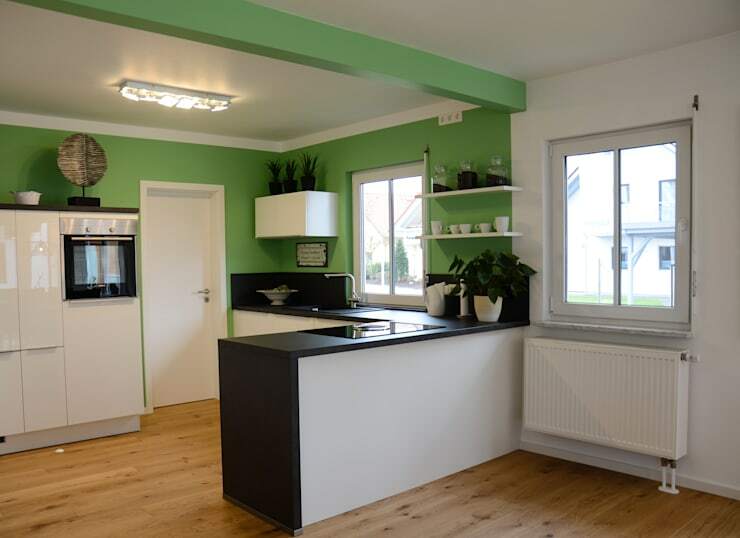 Here the walls are a strong mint green, which contrasts flawlessly with the white furniture and the black surfaces. 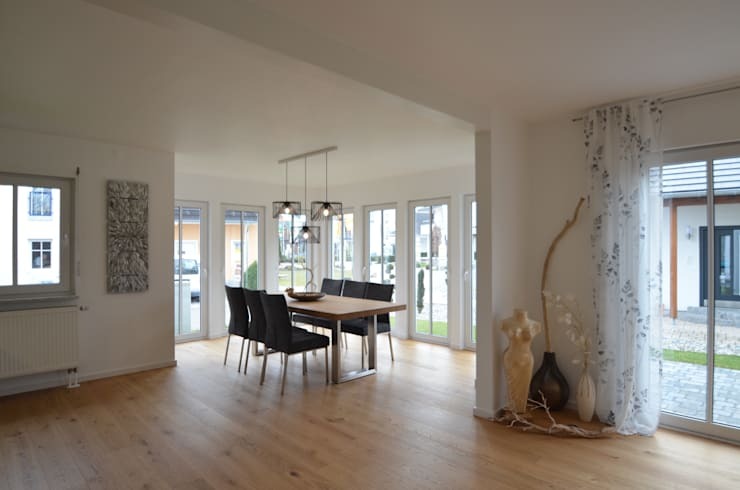 The open plan design of this kitchen allows it to work beautifully with the harmonious flow of everyday life. It creates a very social and interactive environment. Tip: Add a pot plant to your kitchen for a refreshing touch! This bedroom also features a predominantly white design, like we saw in the main bedroom. The advantage of this is that the few colours that are used in this space will stand out and draw attention. The room features a stylish desk and pastel pink linen, creating a feminine and attractive bedroom. Do you see how just by changing the linen, however, you could create a completely different look and feel? This is the advantage of a predominantly white room. For kids, this is a great way to go about decorating a bedroom because their tastes change so often. If you've enjoyed this home, you'll love this family home with a big surprise in the backyard. Don't you love this classic home?